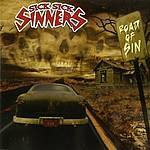 The SICK SICK SINNERS was born in late 2005. Started with a few rehearsals at Mutant Cox..s house, when he realized that he was up to play the slap bass instead of the guitar, which was the original plan. Vlad and Cox used to play together a long ago with Os Cervejas and then Os Catalépticos, Duma came to play the drums and together they recorded the first demo "We are the Sick Sick Sinners" that already spread their name all around the world. After some shows the Sick Sick Sinners changed the line up and invited the punk rocker Magrão to join the band. They already brought their sick music to California, Argentina, Uruguay and of corpse Brasil! Beware! The Sick Sick Sinners are coming and they won..t regret their sins! Fallen man must be brought to realize that he is sick unto death and it is only such sick sinners which God calls to repentance. "By the law is the knowledge of sin" Romans 3:20. We are the SICK SICK SINNERS!! !